The Frozen Tundra is the most brutal, badass thing left in the NFL these days. Games are monopolized by rabid, stat-steeped fanatics who suffer through some of the worst weather season after season to cheer on the Pack and wear cheese on their heads. Some stats: Population of Green Bay: 101,025. 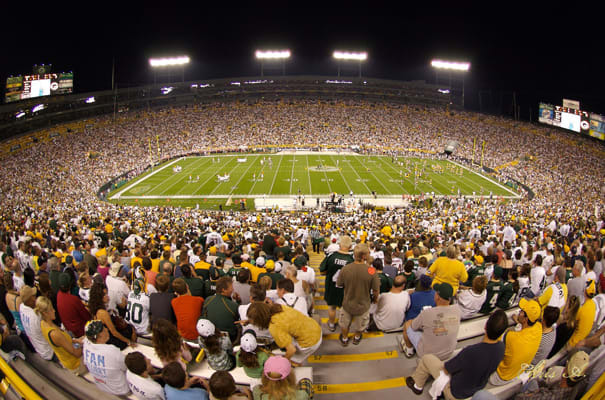 Capacity at Lambeau Field: 72,928. Titles captured by the Green Bay Packers: 12 (they call it Title Town for a reason). Average high and low temperatures in Green Bay, WI in January: 24ºF/7ºF (Lambeau is outdoors). Oh, and the other 28,000 residents? They're shoveling snow.